In his talk, Robin will discuss some results from his PhD research so far. Why do many people think Virtual Reality could be a powerful tool for education? What kind of possibilities are there? What is the best way to proceed? CleVR specializes in creating complete and customized Virtual Reality (VR) solutions for a wide range of purposes in the (Mental) Health Care sector. Guntur will talk about the interactive applications they have created to treat fear of flying and Social Phobia. Gosse Mol, Han Lie, Roos Hoefnagel & Nickolas Ioannou will present the VR game they have created where children learn the practices of taxonomy in a playful way. 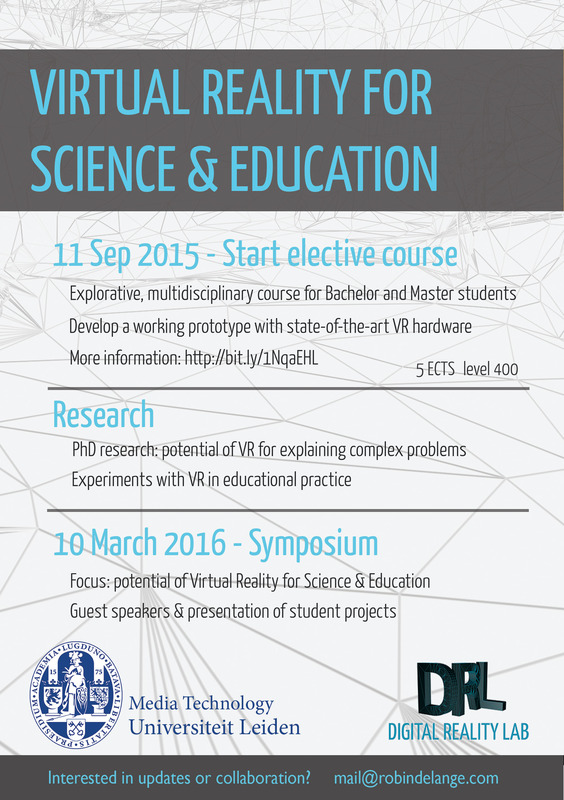 This project was part of the VRSE course and created in collaboration with Naturalis. IJsfontein designs and develops playful (digital) learning based on the belief that people are naturally curious and intrinsically motivated to develop themselves. Hans will talk about the VR projects they created for Veilig Verkeer Nederland and the new Waterlinie Museum. Lisa will discuss the use of the placebo effect in virtual health care, based on her Media Technology graduation research that compared real-world placebo’s with virtual ones. Bauke Smits & Desiree de Ridder will present the VR application they have created that teaches Chemistry students the complex shapes of atomic orbitals. This project was part of the VRSE course. To explore which role Virtual Reality can play in the future of education, Sander Veenhof has been developing and testing experimental multi-user VR learning environments for classroom use. In his talk, he will share the results – but the failures too. During the day visitors can try many different Virtual Reality demonstrations and experience the potential of VR themselves. The talks and experiences can be discussed during the (free!) drinks at the end of the day. The symposium is free for everyone, but tickets are limited. Registration via this form is required. Project demonstration. You will have a stand to showcase and explain your work during the day. This symposium was made possible by the LUF, the Gratama-stichting and the Faculty of Science.